Today is the fifth day in the octave of Christmas. 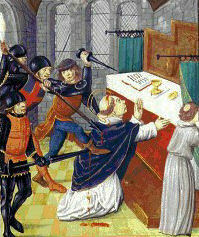 The Church celebrates the optional memorial of St. Thomas Becket, bishop and martyr. He was born in London and after studying in Paris, he first became chancellor to the king and then in 1162 was chosen Archbishop of Canterbury. He went from being "a patron of play-actors and a follower of hounds" to being a "shepherd of souls." He absorbed himself in the duties of his new office, defending the rights of the Church against Henry II. This prompted the king to exile him to France for six years. After returning to his homeland he endured many trials and was murdered by agents of the king. Given the tempo of the liturgical season with its feasts it is easy to overlook that one saint who for many centuries was, after Mary and Joseph, the most venerated person in European Christendom. Thomas Becket was born in 1118 of a merchant family. He studied in London and Paris, entered the service of Archbishop Theobald of Canterbury, became Lord Chancellor under King Henry II in 1155, and in 1162 Archbishop of Canterbury. Till then a submissive courtier, he now initiated a fearless struggle against the king for the freedom of the Church and the inviolability of ecclesiastical property, occasioning his imprisonment, exile, and finally martyrdom (December 29, 1170). Canonization came quickly (1173); in 1539 King Henry VIII ordered his remains burned. Formerly the Breviary included this summary of the saint's last days: "Calumniators informed the king that the bishop was agitating against him and the peace of the realm; and the king retorted that with one such priest he could not live in peace. Hearing the royal displeasure, several godless courtiers agreed to do their sovereign a favor by assassinating Thomas. Secretly they traveled to Canterbury and fell upon the bishop while he was attending Vespers. His priests rushed to his aid and tried to bar the church door; Thomas opened it himself with these words: The house of God may not be defended like a fortress. I gladly face death for the Church of God. Then to the soldiers: I command it in the Name of God: No harm may be done to any of mine. Thereupon he cast himself on his knees, commended his flock and himself to God, to the Blessed Virgin Mary, to St. Denis and other holy patrons of his church, and with the same heroic courage with which he had withstood the king's laws, he bowed his holy head to the sacrilegious sword on December 29, 1170." With all the strength that is given us for the defense of God's rights, we must resist those who seek to subject the Church to their power, even if they are those to whom on other grounds we owe service. In St. Thomas of Canterbury the Church celebrates one of her great bishops; by applying to him the Gospel of the Good Shepherd she venerates in him the true pastor of Christ's flock who gave his life for his sheep. Patron: Clergy; secular clergy; Exeter College Oxford; Portsmouth, England. Symbols: Sword through a mitre; pallium and archbishop's cross; battle axe and crosier; red chasuble; altar and sword. Often Portrayed As: Archbishop with a wounded head; archbishop holding an inverted sword; archbishop kneeling before his murderers; archbishop being murdered in church. Read more about this historical event. For some web sources see The Murder of Thomas Becket, 1170, and more information on Henry II. Watch this You Tube video of Canterbury Cathedral. Some wonderful literature is based on this saint. Canterbury Tales by Geoffrey Chaucer (1342 - 1400) follows a group of 30 pilgrims traveling to the Canterbury Cathedral, the pilgrimage spot of St. Thomas Becket. T. S. Eliot wrote a play called Murder in the Cathedral based on St. Thomas' murder.